Like the two specials "Friday Night Frights" and "Why Do Ghouls Fall in Love?" which were released together on one DVD that I reviewed previously, "Ghouls Rule" is CG-animated by Canadian studio Nerd Corps Entertainment (have to love that name.) The quality of the animation isn't as good as a typical CG-animated feature film, but a step above most made-for-TV fare. 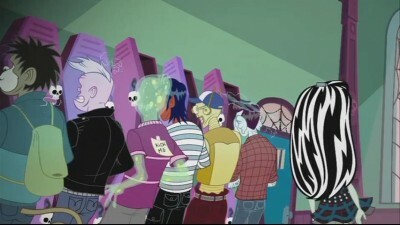 As before there is an interesting design scheme, with the Monster High school building resembling a castle and most objects are coffin-shaped, including the school lockers (reminding me of the cover for the 1980s B-movie My Best Friend is a Vampire), speakers and cell phones. 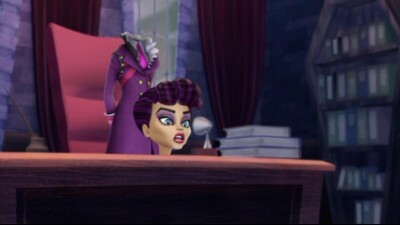 Although "Ghouls Rule" was released on DVD a few months before the other double-feature disc, it was produced after those two specials and runs longer (72 minutes), allowing for a bit more plot and character development although it is still rather fast-paced and some dialogue is hard to follow the first time around. Unlike the other two specials, on DVD this runs seamlessly with no black-outs for commercial breaks although it premiered on Nickelodeon where no doubt they were present. 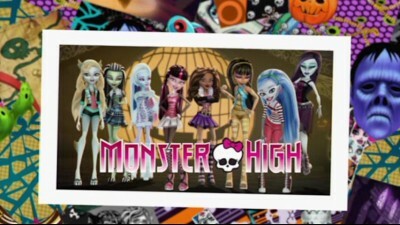 The story here is centered around Halloween, which of course is a perfect occasion for the Monster High franchise. Like the movie Hotel Transylvania, there is an "us versus them" issue amongst the monsters towards the humans, or "Normies" as they're referred to, of the neighboring town of New Salem. Basically the Normies have persecuted the monsters into staying out of their town, with the police quick to arrest any who venture in, especially around Halloween. It's all because of a few misunderstandings from long ago- for example Draculara was once seen by humans with tomato juice on her face which was assumed to be blood, causing her family to be driven away with torches and pitchforks. The reality is that, as Frankie and her friends discover in the catacombs under the school, monsters and Normies used to party together at Halloween. A group of kids from the Normie high school (New Salem High) starts taunting Monster High by throwing eggs and toilet paper on the front of campus. The Monster High gang sneaks over to the New Salem High to retaliate, but it appears someone's already beaten them to it when they find the Monster High sign spray-painted there already and hear the police already on the way. To avoid being blamed for it, they head home but end up invited into a human's Halloween party after being mistaken for other kids and complemented on how good their costumes are. From here, a few of the monsters and Normies find they have things in common and become friends, but some humans still have it in for the monsters and try to get them in trouble, setting one of them up for the "Trick-Or-Treatment" (essentially a public execution) on Halloween night. Audio is in Dolby Digital 5.1 and sounds about on par with a modern TV production, with sound mostly kept up front with just a couple surround effects. Spanish and French dubs are also included in 5.1, along with English SDH, Spanish and French subtitles. Three Monster High Shorts made for the MonsterHigh.com website are included, which appear as more traditional hand-drawn animation although I'm sure they were at least partially produced via computer. These are closer in spirit to how "Monster High" might have looked as an old-style Saturday morning show, although they're in 16x9 format. Audio is in 2-channel with the same subtitle options as the main program. The disc opens with a promo for the other "Monster High" double-feature DVD with "Friday Night Frights" and "Why do Ghouls Fall in Love? ", letterboxed in a 4x3 frame with 2-channel sound. 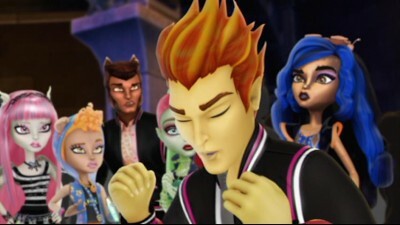 Although I'm probably outside "Monster High"'s intended audience, I've enjoyed what I've seen from its DVD offerings so far. While it would be interesting to see more adult elements included, as it is I see it as a refreshing take on the traditional doll franchises of the past few decades with a good message to kids that it's OK to be different, rather than conform to what most people think is perfect (and Barbie's still around for those who don't agree!) As I mentioned in the other review, a live-action "Monster High" movie is in development so I'll be interested to see how that turns out.